Be the first to share your favorite memory, photo or story of Kregg. This memorial page is dedicated for family, friends and future generations to celebrate the life of their loved one. 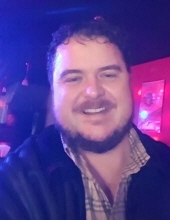 Kregg W. Muninger, 42, of Parsons, died at 9:20 p.m., Sunday, February 3, 2019 at the Labette Health Emergency Room. His death was unexpected. He was born on April 27, 1976 in Parsons, to Monte and Cathy (Cinotto) Muninger. Kregg attended Parsons schools and graduated from Parsons High School in 1994, Labette Community College and Pittsburg State University. He had worked previously for Commercial Bank, C&M Motors in Independence, Carson-Wall Funeral Homes and Brooke Insurance Company in Pittsburg. Most recently he has enjoyed being around his father’s shop, Monte’s Auto Detail. Kregg had a love for cars and would buy and sell cars as a hobby. He also had a love for animals and taking care of them by volunteering many hours at PALS. Kregg enjoyed spending time with his family and his many friends. Survivors include his parents, Monte and Cathy Muninger, of Parsons; grandmother, Wanda Cinotto, of Parsons, aunts and uncles, Vickie Cinotto, of Parsons, Kenneth A. “Butch” Muninger Jr., of Parsons, Edwin “Ed” Muninger, and his wife, Mary, of Independence, Becky Morgan, of Parsons, and Sarah Tullis, and her husband, Ken, of Parsons; a special cousin and brother, Kenny Delich, and his wife, Melissa, of Parsons and several other cousins. He was preceded in death by his grandparents, Norman Cinotto, Kenneth and Dorothy Muninger and aunt, Grace Muninger. Funeral services will be held at 10:30 a.m., Monday, February 11, 2019 at the Carson-Wall Funeral Home with Pastor Steve Crawford officiating. The family will receive friends from 3 to 5 p.m., Sunday at the funeral home. Memorials are suggested to PALS or First Assembly of God and may be left at or mailed to the funeral home, P.O. Box 942, Parsons, Kansas, 67357. Online condolences may be left at www.wallfuneralservices.com. To send flowers or a remembrance gift to the family of Kregg W. Muninger, please visit our Tribute Store. "Email Address" would like to share the life celebration of Kregg W. Muninger. Click on the "link" to go to share a favorite memory or leave a condolence message for the family.